One of my biggest goals in creating On Landscape was to nurture a more diverse culture of landscape photography, one more accepting of the different reasons for taking pictures and the different genres of the final output. Instead of the hobbyist, the professional, the romantic and the contemporary all solidifying the walls between them I hope that each can be more accepting. One of the biggest barrier seems to be between the contemporary and the romantic and it is true that each photographer will always have his or her own tastes, just as they have their own tastes in food or music. However, everyone can definitely learn to appreciate and possibly learn to love any sort of art (or food, or music) but not without trying. 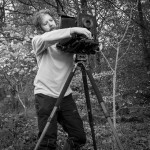 My first experience of Jem Southam’s work was taking a masterclass with him at the Lowry Centre in Manchester. I wasn’t a big fan of Jem’s work but I knew I should try to expand my outlook. After spending the day discussing photography in general and his work in particular I began to see past my own prejudices. To this end I’m proud to include Andrew Nadolski’s interview with Jem this issue and pleased that he has allowed us to include high resolution images from his ‘River - Winter’ book. 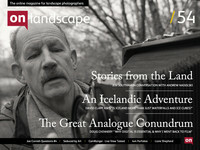 We hope you will see On Landscape as a gateway to see the best of landscape photography in all it's many and varied forms - if you think we're missing out on some of that please let us know, since creating On Landscape we've had to realise it is no longer just our magazine, it's yours as well. We've also included the story of David Clapp's introduction to Iceland and his social media busting Aurora photograph that has managed to garner 3,500 shares since posted. David will be talking in more detail about the creation of this image in the next issue. .. and don't forget we'll be adding the 4x4 section over the following few days and the PDF version will be released in about a weeks time. Until next issue then, which will be a 'Focus on Imaging' special - keep an eye on the news page for updates.